Are you counting down the days until summer? Each year, we look to June 21, the first — and longest — day of the year's warmest season, and wonder what kind of weather we'll get. According to Farmers' Almanac and their "time-tested, 200-year-old weather formula," we can expect a hotter-than-normal summer for 2018. While the northwest region of the United States may get some cool breezes, the rest of the country will feel the sun's wrath. This is especially true if you live in the middle or western areas of the U.S. — the forecast shows some sizzling temperatures headed your way. Those in the southeast will feel the heat too, but they'll also have to deal with harsh humidity. No matter where you live, summer weather has a reputation for wreaking havoc on your hair. So, you have a couple options. You can either fight against the temps or you can roll with the punches. The List chatted with hair experts, salon owners, and stylists to get their opinions on the hottest haircuts of the summer season and — good news, ladies! — they'll also keep you cool. Here are some options for your next hair appointment. If there's one hairstyle that could fit every face, it would have to be the lob, or long bob. Not too short, not too long — it's essentially the Goldilocks equivalent of, well, locks. Krissy Johnson, a modern millennial stylist and owner of Alexander's by Krissy in Los Angeles, California, said this haircut is getting even more popular as the summer season rolls around. Why? "People want to cool off and lighten up!" Johnson explained. She added, "Collar bone length up to just above the shoulders, angled higher in the back or not, looks great with beachy waves." This style comes quite close to being effortless. When the heat of the summer hits and it feels too hot to even move, you'll be happy you chose a style that can be worn without being blow-dried or flat-ironed. Also, if you opt for a lob with a short angled back, you won't have to deal with sweaty neck syndrome that is all to common in the summer months. It's a win-win. There's no denying the adorability of bangs. Zooey Deschanel has certainly proved that. How Deschanel survives the summer, however, is another story altogether. Fred Connors, renowned stylist and owner of FRED.nyc, located in Manhattan, New York, said his clients are looking to grow out their bangs this summer to, as he put it, "help beat the inevitability of a sweaty forehead." If you've ever had bangs, you know he speaks the truth. Growing out your bangs can be a tedious process, to say the least. In fact, it takes about three months to fully grow them out, so if you want to avoid a dewy forehead and stringy bangs, you better get started. When speaking to Cosmopolitan, celebrity stylist Cash Lawless recommended cutting only the center of your bangs while the rest should be left to grow. "Cutting them in the center only will help the outer corners blend in with the rest of the layers in your hair cut as they grow, so you'll end up with a style that's sweepable to either side." Of course, cutting the center of your bangs also enables you to actually see so, that's a definite plus. In addition to clients of FRED.nyc growing out their forehead fringe, owner and stylist Fred Conners says the shag is back — and it's back in a big way. Luckily, the modern shag is quite a bit different than Jane Fonda's signature do of the early '70s. You also don't have to be Jane Fonda to pull off the layered haircut these days — phew! "The shaggy version of any haircut is on people's radar," Conners told The List. It just so happens that this look is also a perfect style for unforgiving temperatures. "Shags, short and long, work best with humidity and are forgiving in the summer when hair tends to frizz," Conners explained, "A little frizz actually helps rock a shag." That's right — your old enemy frizz may actually end up becoming your bestie this summer. If you're going to go everywhere together anyway, you may as well get along, right? If you're not sold on the summer shag, the shake is another retro trend to try. Master stylist of Spa on Penn in Kansas City, Missouri, Andrew DeShon gave the The List all the deets about this refashioned look from the '70s and '80s. "[It's] a very layered, soft haircut. … This cut is not necessarily designed to give you a lot of volume, but a lot of movement." If you're worried about being able to pull it off, don't be. "It's an ideal cut for a lot of face shapes because of all the customization you can put into it," DeShon added. From short fringe to long layers, this look can adapt to your haircut of choice. And if you're thinking this cut also requires a new color this summer, please note that silver is so last season. "We are going back to buttery-blonde and a more healthy blonde look and beige tone," DeShon explained. This is good news for your skin tone as these hues won't wash you out. The '90s called. They said we can borrow their haircuts. And shouldn't we? After all, the '90s was a pretty phenomenal time for hair — big hair. Think: "'90s supermodel beach hair," says Fred Conners. He explained that these "big, bouncy, textured cuts with long layers" look best with "extra volume." The Cindy Crawford-esque do is certainly making a comeback, Conners confirmed. For those of you who aren't into cutting your hair just because this summer's going to be a scorcher, you can definitely embrace this "go big or go home" hair motto. One of the great things about these voluminous styles is how great they also look pulled back. Plus, if you really want to rock the '90s look to the max, fear not: scrunchies are also on their way back. Model Bella Hadid sported the statement hair-tie in the summer of 2017, which means we'll likely see even more this summer. If playing it safe isn't your thing, bold hair never goes out of style. Keala Archie, master stylist and owner of Revelations Beauty Boutique in Central Valley, California, recommends trying a mohawk this summer. That is, for those of you who are looking for an "edgy yet playful look," Archie explained. Aside from getting a buzz cut, it would be hard to beat the cooling effect a mohawk would have during the sticky summer months. This partially shaven look may be considered a risky endeavor, but it's also one that many women of many ethnicities can pull off. Nikki Brown of Essence wrote, "There isn't a hairstyle Black women can't pull off. The mohawk is one of them." There are also tons of different ways to style a mohawk and, if you're nervous about taking the leap, you can even try out a faux-hawk in the meantime. This summer may just be the season to rework some great trends of decades past. The afro, which was most popular in the mid- to late-1970s, is starting to make a resurgence. Dee Carrington, a hairstylist in Florida, explained to Ebony, "I'd venture to say the Afro is the cornerstone of the [natural hair] movement, but it has emerged as something more unique as it relates to each individual." She went on to add, "Now we have so many different Afro shapes and sizes." De L'isle, fellow benefactor and hair whisperer of Happy Curls, Happy Girls, a line of almost all-normal hair items for characteristic hair, revealed to The List, "2018 will have a place with the TWA [Teeny Weeny Afro]." Perfect for ladies with wavy hair, L'isle clarified that decreased afros or TWAs empower the wearer to "appreciate all the volume and brilliance of wavy hair without a lot of problem." This is certainly an ideal search for summer. Long hair — whether it's designed into a hurl or not — is required to keep on keepin' on this mid year. In case you're willing to shake blasts all through the sweltering summer months — praise! — it might simply pay off. Julien Farel, prestigious big name beautician and proprietor of Restore Salon, Spa, and Fitness at Loews Regency Hotel in Manhattan, New York, said his customers have begun asking for blasts with their long throws. "In the late spring, individuals are demonstrating more skin, wearing less attire so this hairdo helps give them an increase in certainty and security on the grounds that everything looks gentler," he said in a meeting with The List. Regardless of whether you're not into summer blasts, you can even now pull off the summery long bolts. While your nature may not be to connect protracted tresses with summer cuts, the key may simply be in the shading. "I am hearing ladies ask for significantly brighter hues," Farel stated, "with more sunkissed features." These delicate, regular looking streaks will include a touch of summer enjoyable to your locks while empowering you to keep up your length. On the off chance that there's one haircut individuals lament having wore, it's probable the mullet. It's difficult to envision a rebound for the unisex cut appropriately portrayed as "business in the front, party in the back" by David Spade's character in Joe Dirt. All things considered, anything can occur in 2018. Fabio Scalia, a looked for after beautician for New York and London Fashion Weeks and the proprietor of two eponymous salons in New York City, revealed to The List, "what we used to call the mullet" or "strangely longer hair in the back" is making its arrival. In case you're hoping to up your limit bounce amusement, exploring different avenues regarding some shading is never a terrible thought. "Balayage and blondes are dependably on incline!" O'Dowd clarified. 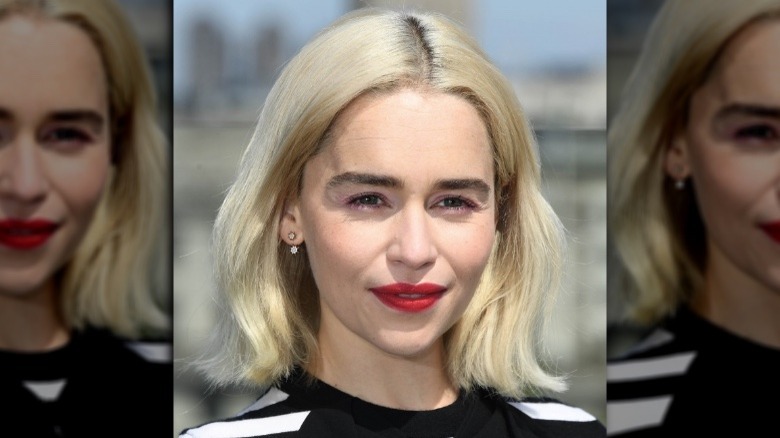 In case you're looking for some VIP motivation, for what reason not go for Emilia Clarke's faded blonde limit sway? However, we'll caution you, you may get a little tongue-tied when approaching your beautician for this look.